The Hudson County Chamber of Commerce offers a variety of programs and groups that help grow the region’s economy and provide invaluable resources for local businesses. Chamber groups bring like-minded business owners and entrepreneurs together to meet needs they have in common, such as networking, learning best business practices, starting or growing small businesses, and serving the community. Chamber programs are designed to be both networking and educational opportunities. Please see below and check out our Calendar of Events for upcoming opportunities to join us. 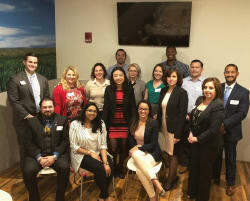 Our Chamber Ambassadors are a group of dedicated Members who are passionate about Hudson County and helping the Chamber to better serve its Members. They volunteer their time with us to engage new Members who join our growing community. Learn more. Our quarterly, complimentary breakfast is designed to help our newest Members become acquainted with the Chamber Staff, learn about the benefits of their new membership and meet other new Members and Chamber Ambassadors. All new Members are invited. Once you’ve officially joined the Chamber, keep a lookout for your New Member Breakfast invitation. 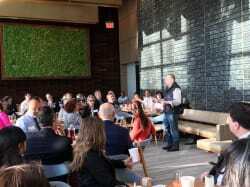 During the spring and fall months, the Hoboken Chamber of Commerce hosts Breakfast Roundtable events, typically on the third Wednesday of each month, and invites a local public or elected official or guest speaker from industry or commerce to discuss a policy issue or project and its impact on Hoboken. Past events have focused on the re-design of Washington Street, the Rebuild by Design Project in Hoboken, and proposed development projects. All Members are welcome to attend, get informed and engage in discussion. Please see the Hoboken Chamber Events Calendar for the next Hoboken Breakfast Roundtable event. Chamber Members are invited to join us for our monthly networking and referral meetings. If you've been wanting a venue to grow your referral network, The Breakfast Club is for you! Breakfast Club meetings are open to Chamber Members only. Meetings provide Members the opportunity to pitch their business, help each other to make referrals, and hear from guest speakers. Chamber Members are also often invited to facilitate these monthly meetings. Please see our Events Calendar for the next Breakfast Club Meeting near you! The nonprofit sector is critical to our national and local economies. In 2013, public charities reported over $1.73 trillion in total revenues and $1.62 trillion in total expenses, according to the Nation Center for Charitable Statistics. In New Jersey, there were more than 40,000 non-profit organizations as of 2013, according to the NCCS, employing about 7% of the State’s workers. The vast majority of these nonprofits were charitable organizations. 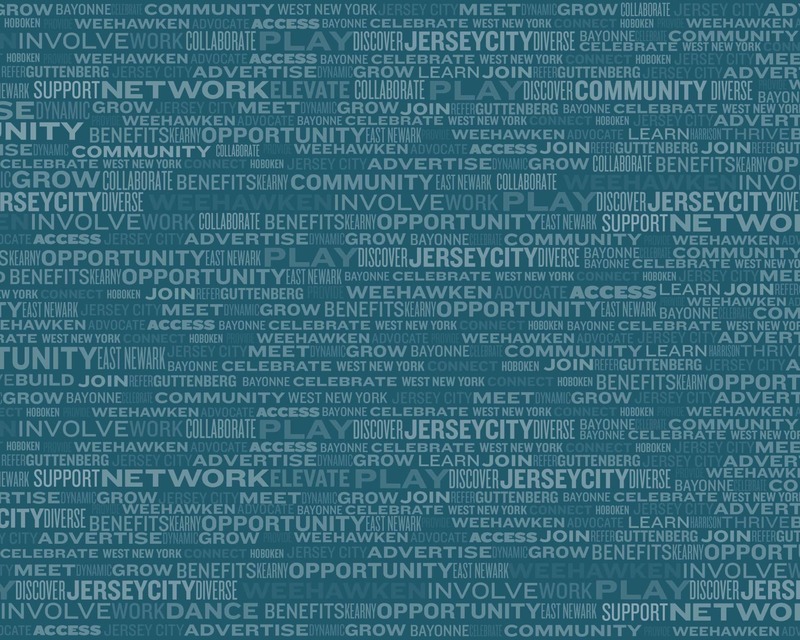 Here in Hudson County there are more than 2,500 non-profits. We recognize the critical impact these Members make on our local economy, in terms of both the goods and services they consume, but also provide back to the local economy and those they serve. Every quarter we bring host a Nonprofit Member Breakfast for our Members in this critical sector so that they may share best practices and learn how to grow their capacity. Every July we host a special Nonprofit Council Reception so that these Members can here from a special guest speaker about trends in the sector. To get involved, see our Events Calendar to attend an upcoming Non-Profit Council Breakfast or ask to be added to our email list. 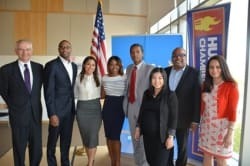 Today’s emerging entrepreneurs and young professionals are tomorrow’s leaders; that’s why our Young Professionals of Hudson County engages those members of the Hudson County business community who are just beginning their careers and launching their own enterprises, those still ascending professionally, as well as college students and recent college graduates. 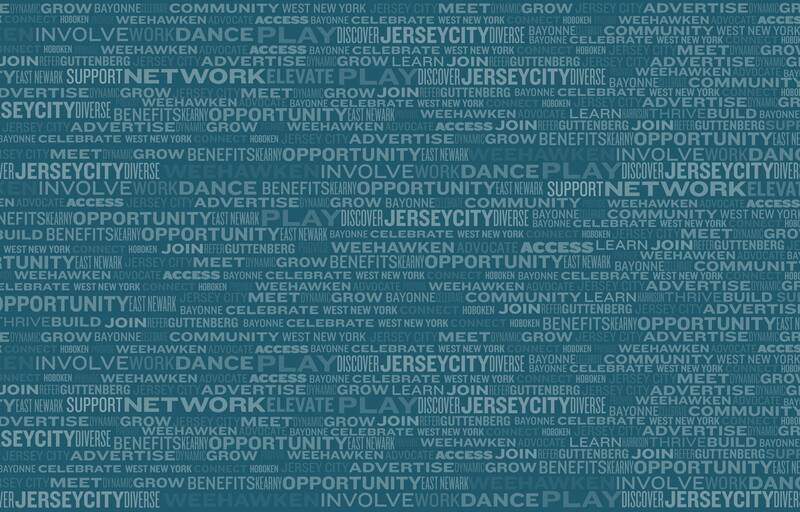 Our goal is to provide activities, resources and events that help these emerging entrepreneurs and professionals get to know the Hudson County community, expand their social networks and learn from seasoned members of the business community. The YPHC also provides opportunities to develop leadership skills, learn about community needs and give back to the local community. The Young Professionals, a Council of the Hudson County Chamber of Commerce, is open to professionals ages 18 - 35. In keeping with our mission to be the leading resource for driving economic growth, the Hudson County Chamber of Commerce has partnered with the Business Administration Department at Saint Peter's University and the Ignite Institute since 2013 to bring a unique opportunity to our Members as well as undergraduate students at Saint Peter's, our Town & Gown Program. Through this collaborative effort, Chamber Members who have a need or desire to engage in a planning project for their business, are paired with their own pro-bono team of consultants. Chamber Members represent the “Town” and Saint Peter’s the “Gown” in this partnership. Who is Eligible? Eligible companies and organizations must be Members of the Hudson County Chamber of Commerce or the Hoboken Chamber of Commerce. Chamber Members who want to take their business to the next level in any of the areas above and who can benefit from the added resources of a student-consultant team, are encouraged to participate. Your Chamber Membership must be in good standing! Prior year TOWN & GOWN participants are eligible to apply again. Since its inception, more than forty Members of the Chamber have benefited from the program. We are once again hosting this program in 2019. The application process typically opens in the fall each year. About the Business Administration Seminar: This senior-level course is aimed at exposing Saint Peter's students to real world challenges. Participants are expected to utilize their knowledge from the diverse fields of study (including finance, accounting, management, international business, marketing, and economics) to solve business problems. While the use of case studies and business simulation games are encouraged, the principal focus is to apply knowledge in the real world through mini-projects that involve small organizations. The course is therefore open only to students who have completed all major requirements. We’ve partnered with a select group of organizations to provide access to educational programs throughout Hudson County. Every spring, summer and fall, the Hudson County Consortium publishes a schedule of business classes and workshops, on topics such as financial management, franchising, starting a business, and much more. Classes and workshops are available to entrepreneurs, startups, early stage and mature businesses, often at no fee or for a modest fee.